Malchus’ eyes stung in the smoky haze of many torches, and his ears rang with the clang of boots and weapons. He let himself be carried along by the crowd of soldiers and temple guards streaming through the gate into the olive garden. Leading the way was a man called Judas Iscariot, purported to be a follower of the revolutionary they were sent to find. Malchus’ master, the high priest, had ordered him to witness the arrest and make sure the prisoner was brought immediately to him. Malchus expected armed resistance, or at least a search for the fugitive and his men. Instead he saw a man robed as a rabbi walking purposefully toward them out of the gloom. A few men followed him, some with swords at their sides. 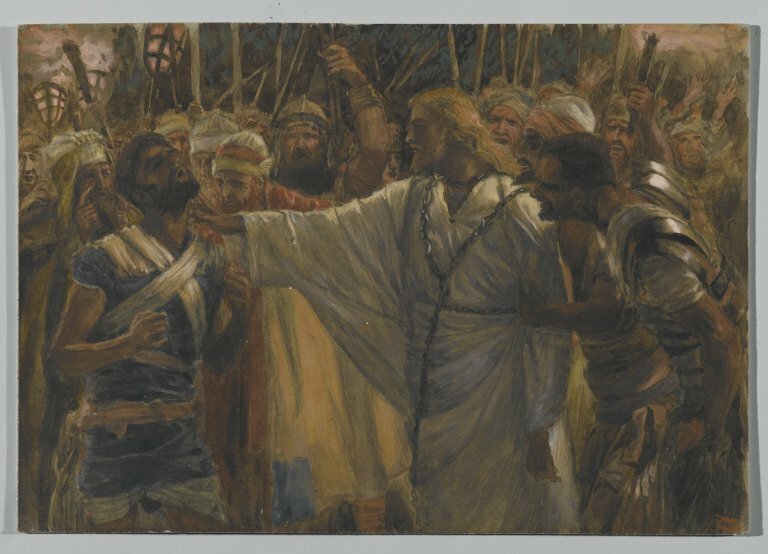 When Judas Iscariot approached the rabbi and kissed him on the cheek, Malchus heard the man say, “Friend, would you betray me with a kiss?” Judas then slunk back behind the crowd. “Who is it you want?”, asked the rabbi. “Jesus of Nazareth,” was the reply. The rabbi’s men drew closer, ready to defend their leader at a moment’s notice. Turning his powerful gaze on Malchus, the rabbi placed his hand over the streaming wound where his ear used to be. He felt a tingling warmth, then the cessation of pain. Never taking his eyes from Jesus, he tentatively raised his fingers to feel a whole, healthy ear attached to his head. His hand came away clean, no blood staining his palm. Before he could speak, the soldiers surged around him to grab the rabbi, bind him roughly and drag him out of the garden. After the rabbi’s crucifixion and burial, Malchus heard rumors whispered around his master’s house, rumours that Jesus was not really dead, that his tomb was empty because he had come back to life and had been seen by many. These rumors caused his master, the high priest, many sleepless nights. But they were more than rumours to Malchus. They were confirmation of the truth that the healing touch he experienced in the olive garden belonged to none other than Jesus, the Messiah, now his Lord and Savior. © Valerie Ronald and scriptordeus 2015. Unauthorized use and/or duplication of this material without express and written permission from this blog’s author and/or owner is strictly prohibited. Excerpts and links may be used, provided that full and clear credit is given to Valerie Ronald and scriptordeus with appropriate and specific direction to the original content.